You’re a student looking for a car. Something compact, good on gas, and perhaps even a little quirky. While browsing through Craigslist, you come across a 2000 Volkswagen Golf; it seems perfect! You arrange a time to meet with the seller, and you leave as the proud owner of the vehicle. After some time, however, problems start rearing their ugly heads. The Volkswagen Golf is a fun, unique, and cost-effective vehicle. The driver’s seat cradles you, and the handling is superb – assuming your suspension is working properly (we will talk about that later on in the review). Being a compact car, driving around corners feels like you are in a go cart. The stock sound system has seperate speakers at your feet for the bass, and small tweeters on the doors for the higher frequencies; this provides great stereo sound. My experience with the Volkswagen Golf has been an interesting and educational ride. I personally am not a Volkswagen fanatic like a lot of people are, but I do love the cars they make. Volkswagens are very nostalgic for me because my mother had one while I was growing up; owning one myself brings back warm memories of the rear facing seat in her old station wagon. I purchased my own Volkswagen Golf in June, 2018. It was a shady deal in Manchester, New Hampshire. The seller didn’t speak English well, which made it difficult to know what may or may not be wrong with the car. However, the car had the best price tag a high schooler could ask for – $1,300. My father and I were dropped off at the car’s location, and after purchasing the vehicle, we began the hour long trip home – after filling the tank with fresh gas of course. This was when we started to notice some interesting, and slightly unnerving quirks about the car. At highway speed, the car seemed to rumble and shake ever so slightly – not enough to be dangerous, but enough to make us nervous. As the months passed, we learned to ignore the obscenely loud “clunk” the car made going over the smallest of bumps, and we had a couple things repaired right away such as brake calipers, and the rear shocks and springs. The suspension was fixed in an attempt to remediate the loud “clunk”, but it didn’t seem to help the problem. We also had a new wheel bearing installed in the front passenger side wheel, which made the car much quieter going down the road. Those repairs were the only ones done at a shop, but they were not the only repairs. 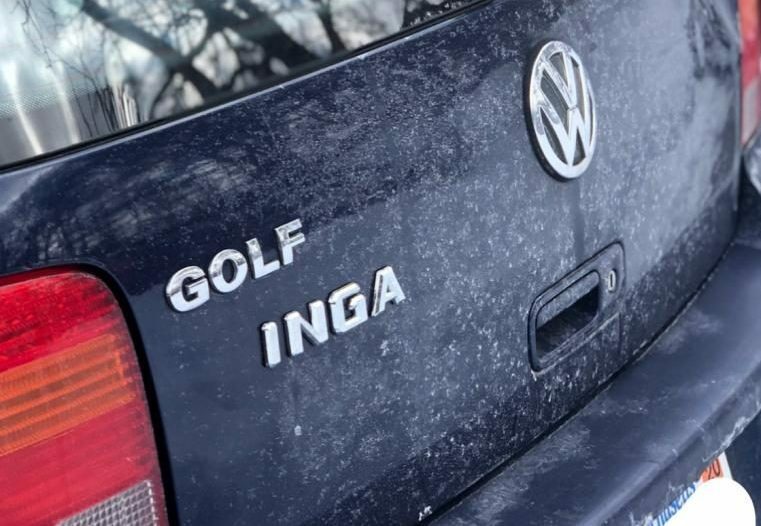 Through all of this, we decided to name the car “Inga” to accommodate its ugly appearance, and German origin. Inga is a stark constrast from my first car – a 2003 Chevrolet S10. The S10 was a small pickup truck, and it was reliable for the time I had it. I sold the S10 once I was able to drive other people with my Junior Operators License. Despite the numerous problems that have arisen from Inga, I have come to love my car. It’s great on gas – approximately 28 miles per gallon, and it’s unusual appearance has become a part of its (sometimes annoying) personality. The car rides very smoothly now, because my father and I changed the rear axle bushings, which had previously blown out. This means no more “clunk” noise when I go over bumps. Inga did blow a head gasket around Thanksgiving time, but that provided a learning opportunity for both my dad and myself to take apart the engine. 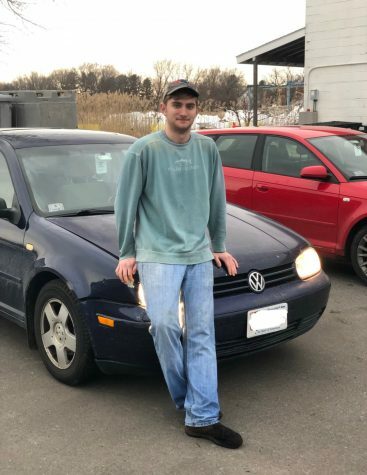 All and all, my Volkswagen Golf has been a fantastic, sporty, and reliable vehicle with only a few mishaps over the last year. For those willing to tackle some of the inevitable issues a Golf will present to you, there is no better car for the price. Just be sure to remember your spare tire! Tougas with his Volkswagen Golf outside of David’s Fish Market.